Expecting a baby is such an exciting time in your life and it’s only natural to want to give your baby the best of everything. But sometimes money can be an issue or you just want to get creative and make something very special for your unborn child! 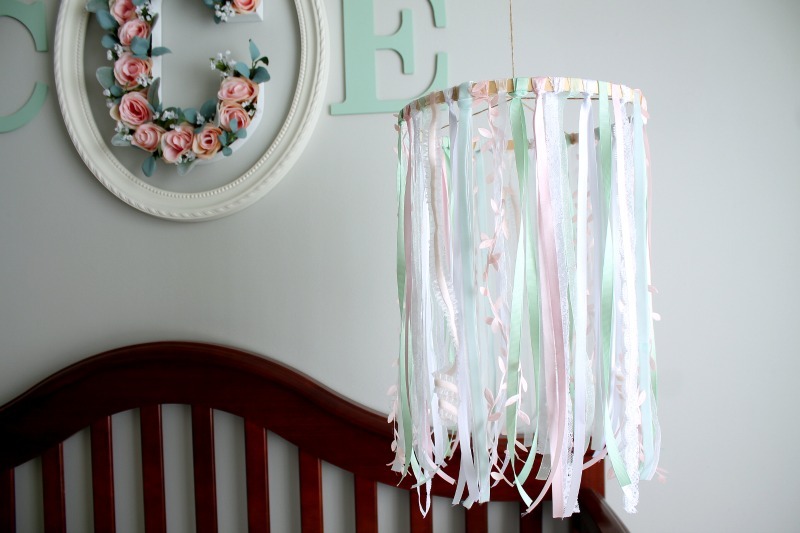 Today we’re showing you how to make a beautiful DIY baby mobile that you can create even if you feel you don’t have a DIY bone in your body! It really is very easy! 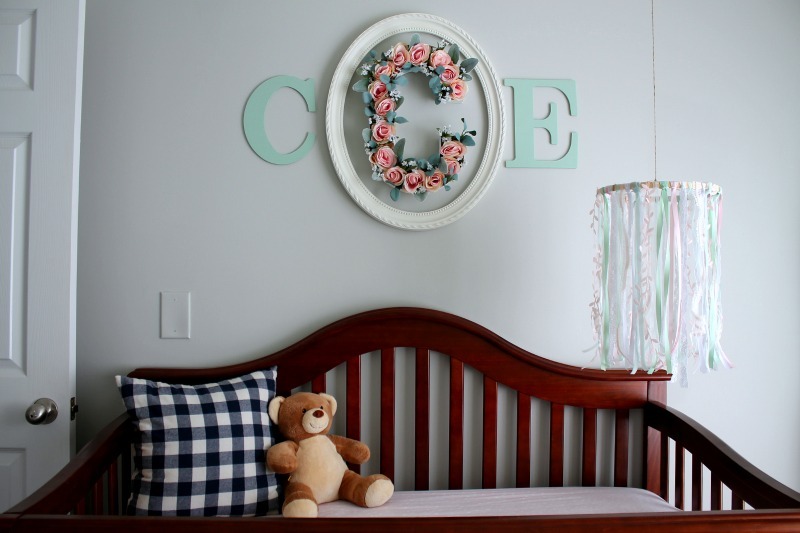 Remember, by the changing colors you can customize it to suit a baby boy, girl or a nursery theme! 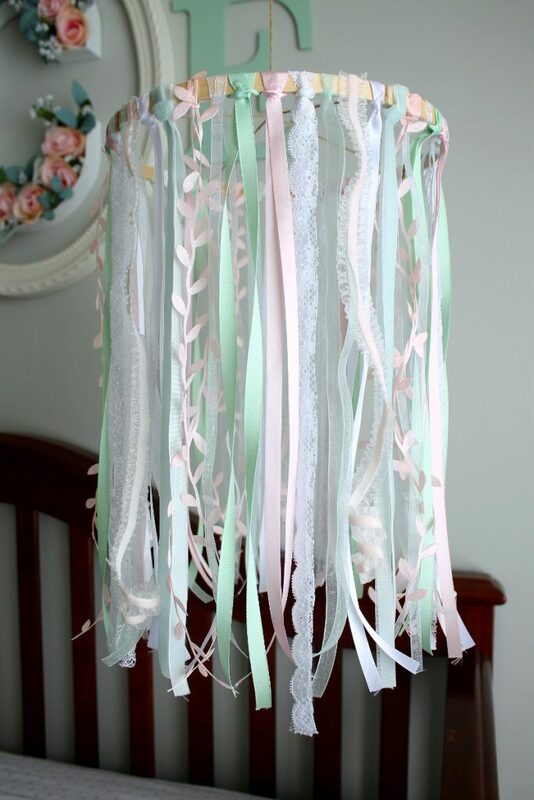 This DIY baby mobile will look perfect in any nursery like this whimsical gender neutral woodlands nursery. Hi Pastel and Macarons readers! My name is Kate and I share DIY, crafts and free printables over at my blog Lady and Laura Kate. I’m super excited to be here today to show you how to make this Etsy worth baby mobile for your little one’s crib! 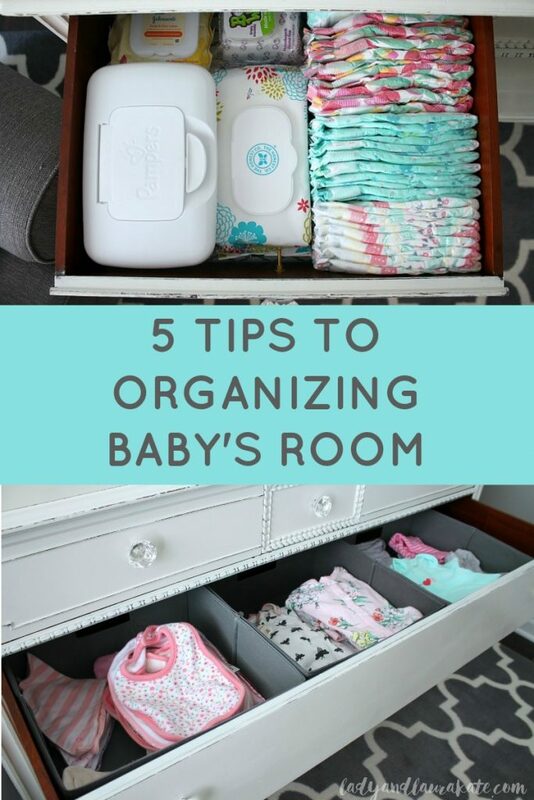 While I was pregnant I became so excited to decorate a nursery and I think I spent about 95% of my day on Pinterest coming up with decor ideas! DIYs are so fun for me that I knew there would be a few that I would do for my baby girl’s nursery! One of which is this DIY baby mobile. These baby mobiles range anywhere from $45 or more on Etsy! Not sure about you but I don’t have $45 to spend on just a baby mobile! I knew I could pull it off for much less especially with the use of coupons and catching some sales at the craft store! **This post may contain affiliate links for your benefit and at not extra cost to you. This helps me to keep this blog running. For more information you are welcome to read my disclosure policy. Thank you for your support. 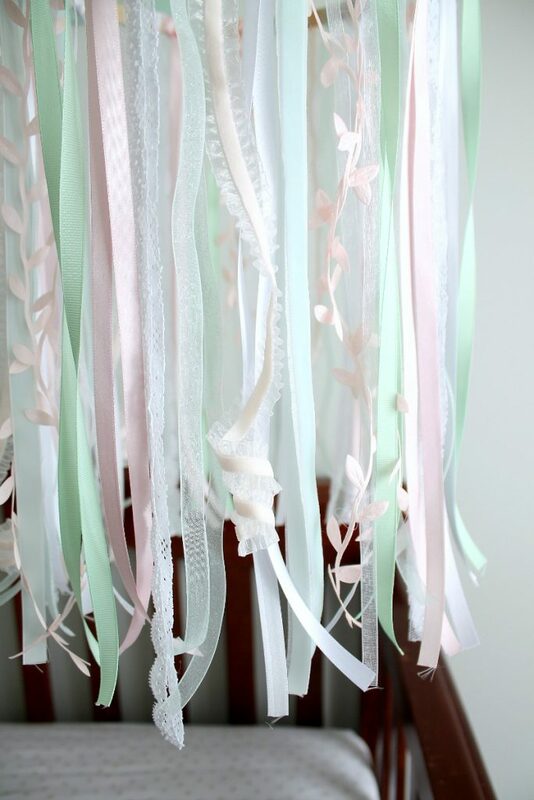 I love the whimsical feel that ribbon offers and the opportunity to customize it to match the colors of the nursery. Obviously I made my mobile for a little girl but it could most certainly be done for a boy as well! While I may have burned my fingers with the hot glue gun a couple times it’s a very simple craft to make! I promise! Start by separating the two pieces of the embroidery hoop, you’ll only need to use the inside hoop that does not have the top screw on it. 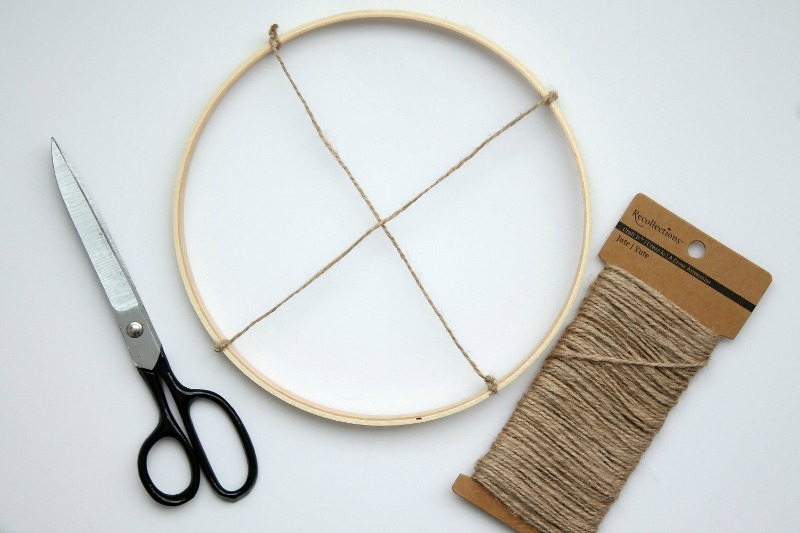 Next, go ahead and tie two pieces of twine to the hoop to make an X, you’ll want them to be fairly tight. Make sure to trim off any extra twine after your knot is tied. 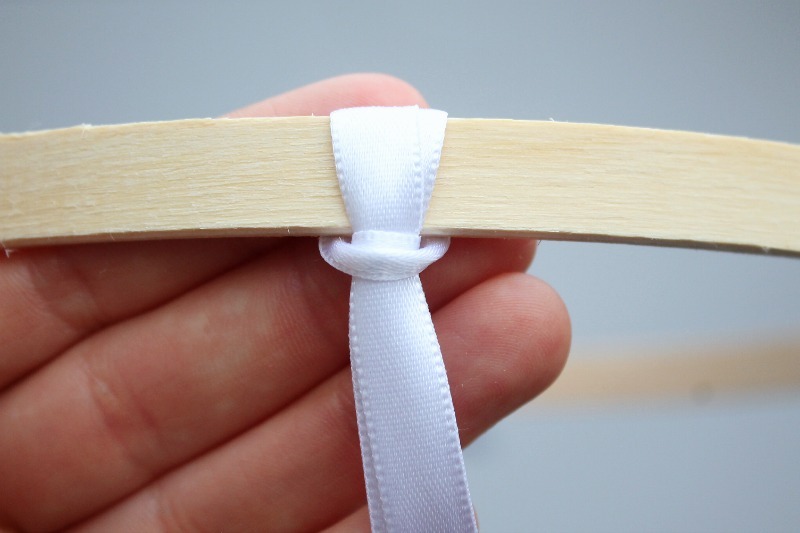 Measure out your ribbon to double the length you want. I measured out mine be around 30 inches total which makes it roughly a foot long once finished. Loop the ribbon in half and place inside the embroidery hoop. Then pull the ends of the ribbon through the hoop and pull tight. The ribbon should look like the picture. 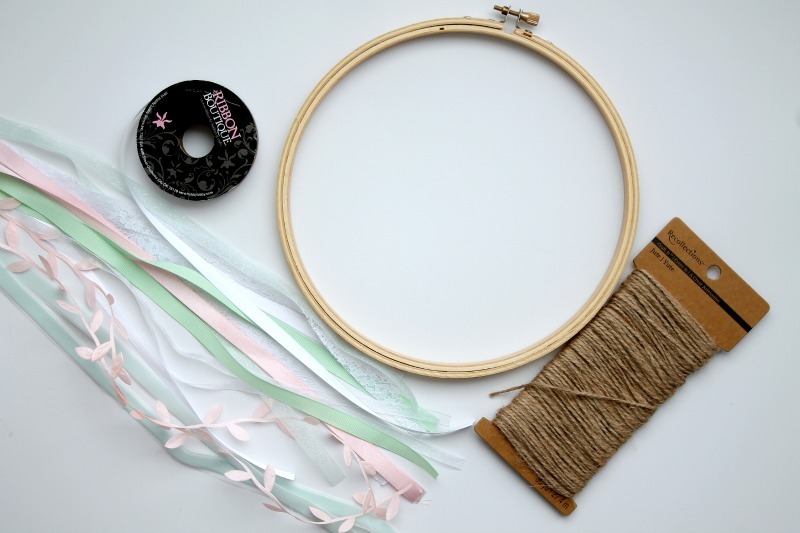 Continue to loop your ribbon until the entire hoop is full. I found that some of the ribbon wanted to slide around and come undone. 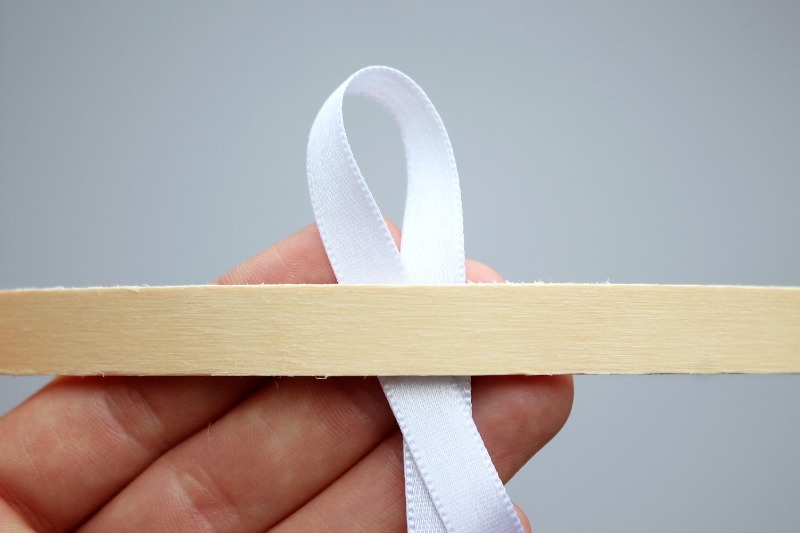 To solve this add a dab of hot glue behind the ribbon. 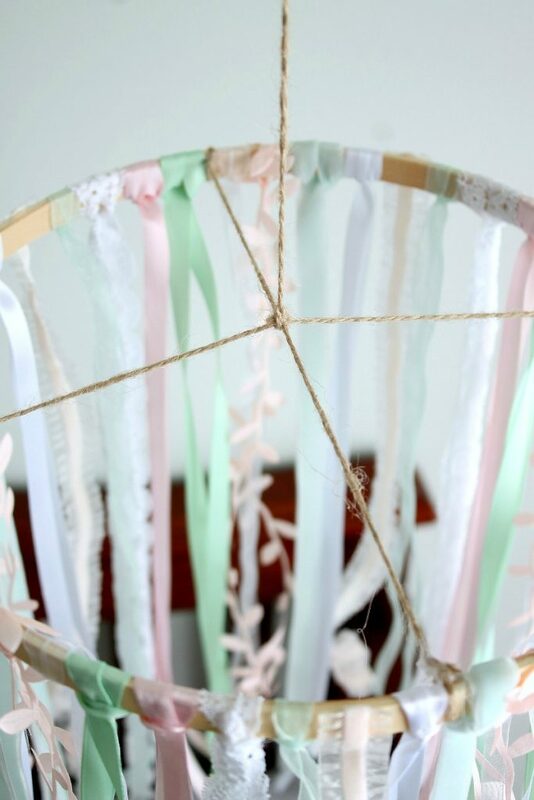 Lastly you’ll cut a piece of twine to hang the baby mobile from. You’ll need to measure from your ceiling to around where you want the mobile to hang plus a little extra just to be safe! Then where the two pieces of twine that you already tied on meet you’ll knot the third piece several times. 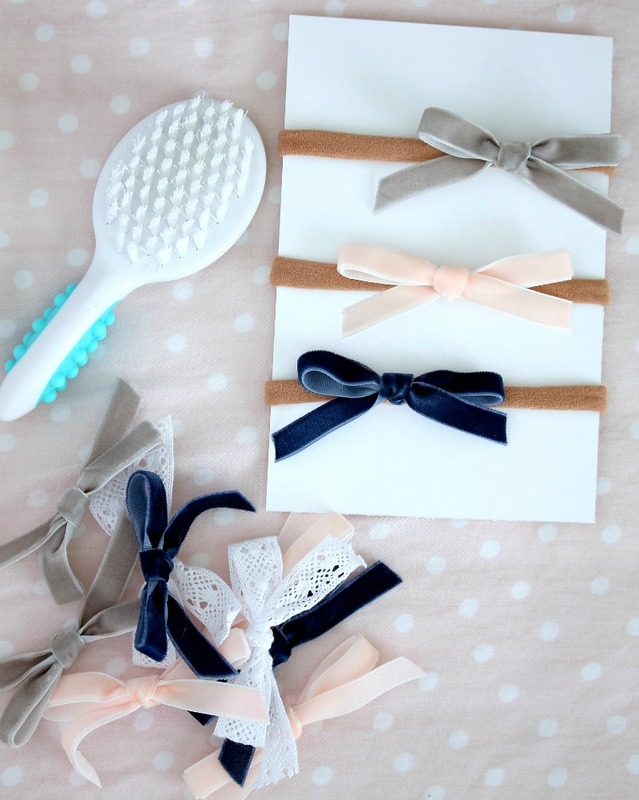 Trim away any extra once your knot is tied. The baby mobile is very light weight, I used a mug hook screwed in our ceiling to hang it from! Here it is all pretty and finished! 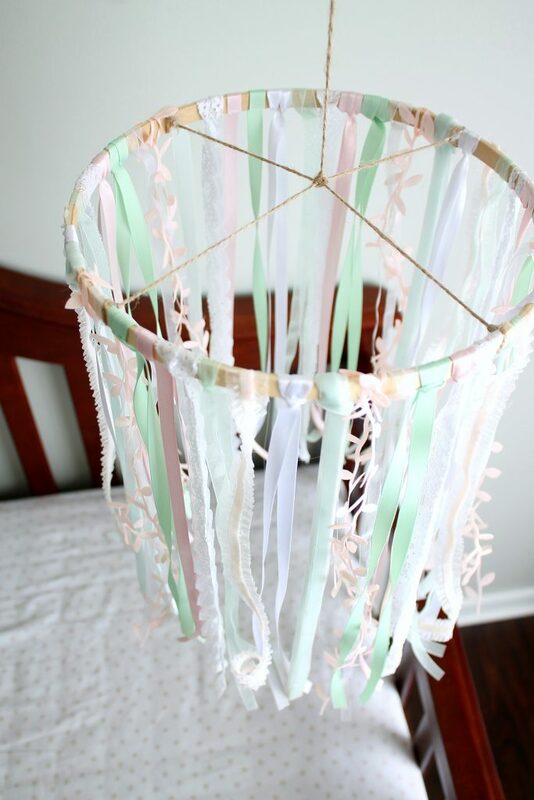 The options are endless on how to customize this DIY baby mobile! I plan to make one for each of my future little ones as well. Plus this could be a sweet and thoughtful baby shower gift! 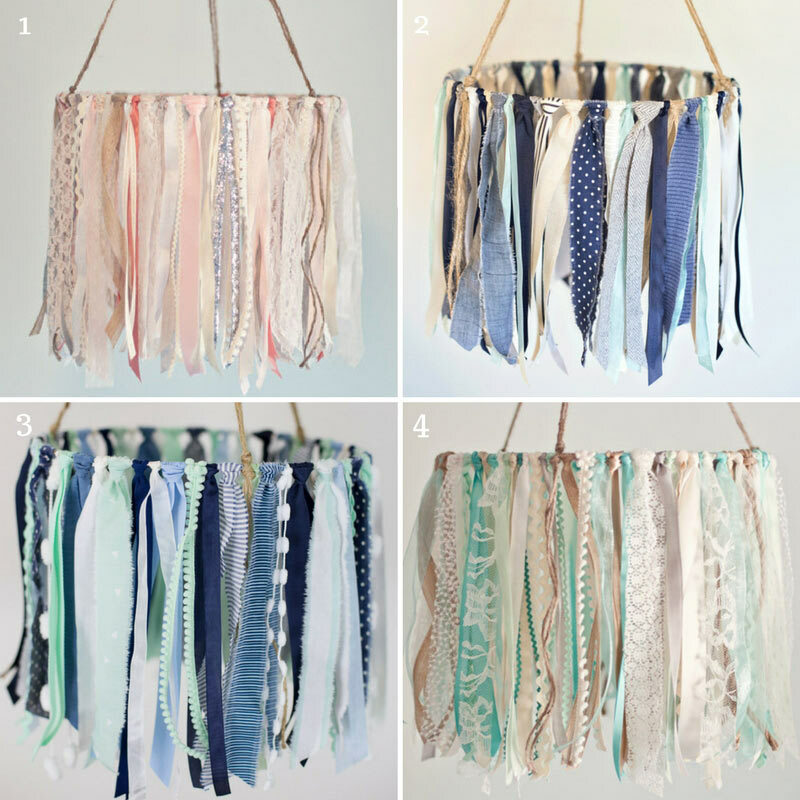 If you love this idea but really prefer not to make it yourself or have no time, then you can find some amazing lace mobiles on Etsy. Here are some of our favorites from our favorite seller The Glittered Barn! 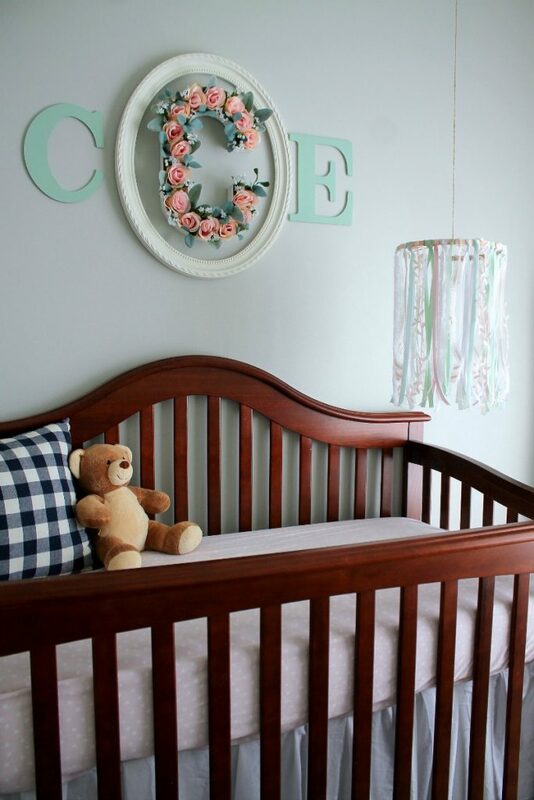 Do you think you’ll add this sweet décor to your baby’s room? 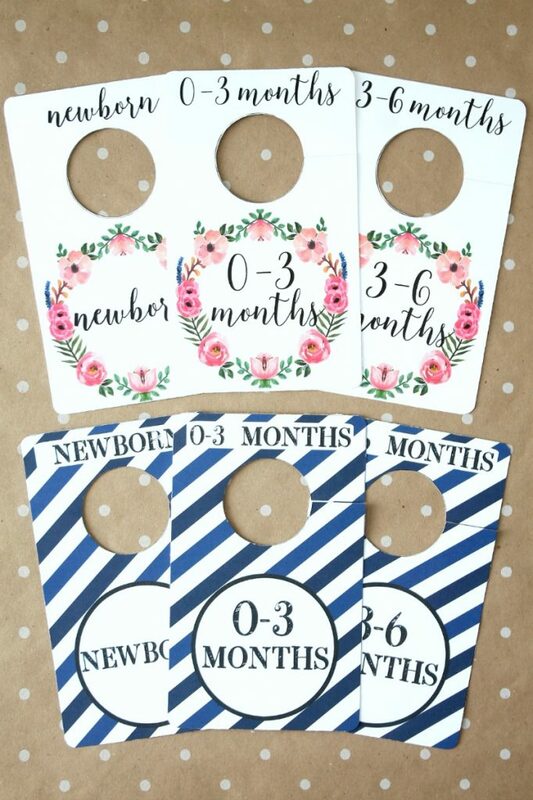 Have you made a baby mobile before? Or would you prefer to buy one? Let us know in the comments! LOVE THIS POST? HERE’S OTHERS YOU MAY ENJOY! This is so cute!! I can’t believe how simple to make too! Kate, this is so lovely. I wish I had made something so pretty for my daughter when she was a baby. That was before I discovered my creative side. There’s always future grandbabies I can make something beautiful like this some day.